Around the time I started homebrewing — back in Boston in 1991 — I was interested in “regular” English ales, and especially pale ales. The full impact of the craft beer revolution hadn’t hit yet, and English ales such as Bass and Fuller’s ESB were still new, flavorful, and interesting. Plus, there was a brewpub there called Commonwealth Brewing that brewed excellent English-style ales. And additionally, the ingredients and information needed to brew decent renditions of English pale ales were available. So, it wasn’t really surprising that I brewed quite a few English pale ales, ESBs, and the like early on — to me they were “just plain beer” and I enjoyed them alongside the newer, hoppier American pale ales that were emerging. Many years later, I developed a Fuller’s ESB clone. I based the clone on information published by Fuller’s and found in Les Howarth’s book, “The Home Brewer’s Recipe Database,” which listed the statistics and the percentages of ingredients for a wide variety of beers. Because yeast strains derived from the Fuller’s yeast strain are available to homebrewers, and the recipe is simple, a competent homebrewer can easily make a respectable clone of this beer. 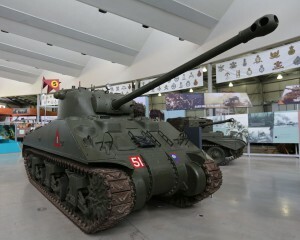 The name Firefly refers the “up-gunned” version of the American Sherman tank the British favored in late WWII. In 1943, when the Germans rolled out their late war tanks — the Panthers and Tigers — the British felt the standard 75 mm gun on the Sherman was inadequate and they replaced the Sherman’s main gun with a 17-pound anti-tank gun. (US forces upgraded some Shermans to a 76 mm high-velocity gun, but tried to rely on dedicated tank destroyers — most notably the M10 — to engage the newer German tanks.) Essentially, I named my beer — a British thing modified by an American — after the tank, which is an American thing modified by the British. A “balanced” name for a balanced beer. A slightly hoppier rendition of a homebrew Fullers ESB clone. The beer has a malty character, with some caramel flavor, balanced by 40 IBUs of hop bitterness. The aroma of Goldings hops completes the beer. Mash at 153 °F in 14 qts. of water. Let the mash rest for 60 minutes. Mash out to 168 °F, if you can manage it. Recirculate and collect between 6.5 gallons and 7.0 gallons of wort — however much you can boil down to 5.0 gallons in 90 minutes. Boil wort for 90 minutes, adding hops at times indicated. Chill wort and transfer to fermenter. Aerate and pitch yeast. Ferment at 68 °F. Mash at 67 °C in 13 L of water. Let the mash rest for 60 minutes. Mash out to 76 °C, if you can manage it. Recirculate and collect between 25 L and 26 L of wort — however much you can boil down to 19 L in 90 minutes. Boil wort for 90 minutes, adding hops at times indicated. Chill wort and transfer to fermenter. Aerate and pitch yeast. Ferment at 20 °C. Chris– what do you reckon the difference is between increasing the malt up to say 11 lbs and mashing at 149 F, vs. using flaked maize? More base malt flavor, if you’re into that sort of thing. Ettels; sure, but I don’t know if *really*. I’d love to taste the two methods side by side. I think the difference would be small; you might get a bit more malty flavor, but nothing that wouldn’t be fine in an ESB. 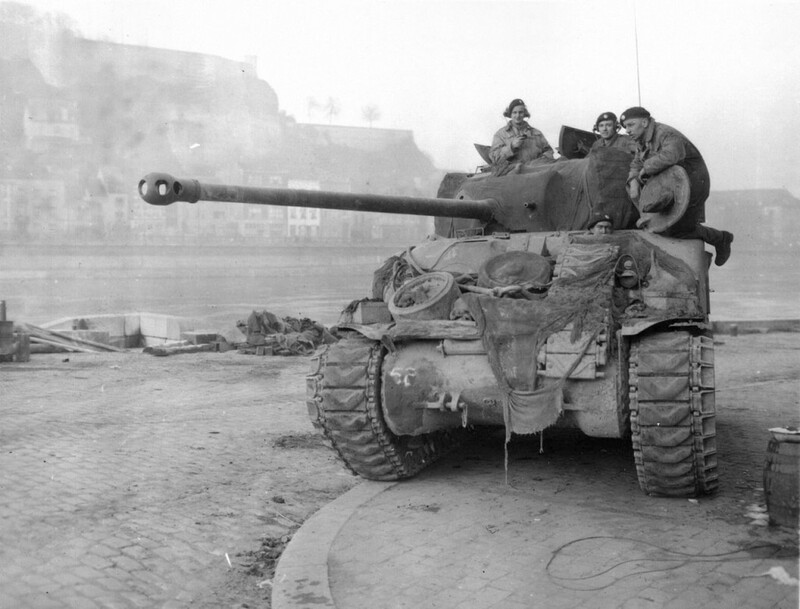 I’m a sucker for a good story, and the tie-in with British mods to the Sherman tank had me all-in. I was looking for something different to brew, and this popped up in my head. I brewed it to be a little lower ABV (5.5%, 1.055 OG), and I have to say I’m pretty darn happy with the results! A nice firm (but not overwhelmingly so) bitterness with good caramel notes. Very satisfying! Thanks for the inspiration! This is the first beer I’ve brewed since building my wort chiller, and now that I know how well that worked, a lager is now within reach. Been jonesing to try your Edge of Seventeen Maibock!